Do you shop on Amazon? You can support TIFD when you shop! Use smile.amazon.com and specify Texas International Folk Dancers as the non-profit you would like to donate to, and we will get a small percentage of the proceeds. 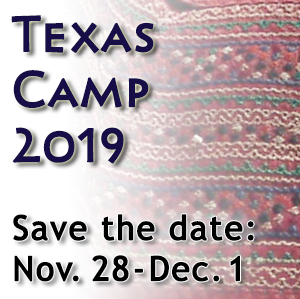 The 2018 71st Texas Camp featured Lee Otterholt teaching mainly dances from the Balkans with Michael Seider and Anna Sapozhnikova teaching Cajun and Zydeco dancing. The 71st Texas Camp has come and gone, leaving participants with fond memories of idyllic weather, fun dances taught and learned, lively parties and visiting with friends old and new. Look for a more descriptive writeup, coming soon. And as always, don’t forget to fill out your camp survey. Let us know what you thought of camp — all suggestions and feedback are welcome! This entry was posted in Uncategorized on 2 December 2018 by tifd.